I was a little spoiled this Father's Day weekend... my parents came to see ME! But since this was all about Dad, we spent much of our Saturday at Stones River National Battlefield. Dad is a military history buff, but particularly into the Civil War. So visiting the site of a major battle was definitely fun for him! 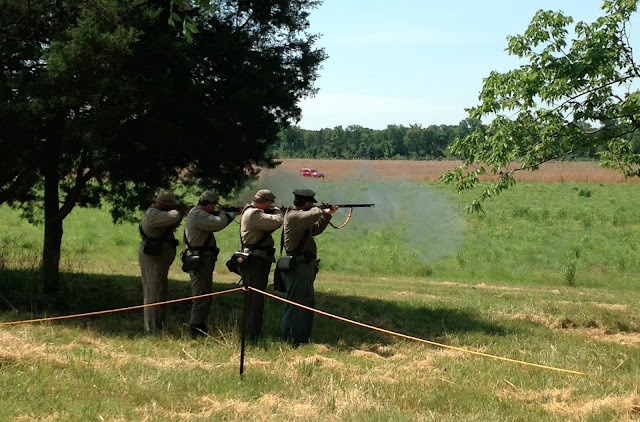 This weekend actually had a bunch of living history happening, as part of the 150th anniversary celebrations happening around the country as different battles are commemorated. There were some great talks during our visit, from real horses with the cavalry, to signal demonstrations, to the firing of rifles and cannon. I think Dad really soaked it all up. If it had been cooler outside, he would have liked to walk the grounds a bit more; I think I'll be taking him back there sometime!